I’ve been keeping a secret from you for nearly three years. It’s been hard to keep quiet, but at the same time there wasn’t much to talk about—I didn’t have anything concrete to show you. But today, I’m bursting with excitement, and can hardly contain my exciting news. Everything I have been working on for the past three years has been leading up to this. I’m excited to tell you about HITO: the world’s most powerful nutrition program to improve your health. 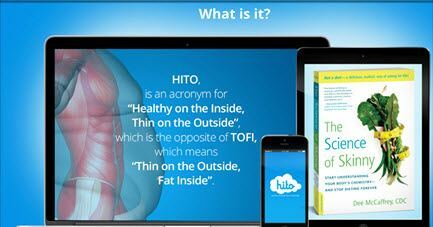 The name HITO is an acronym for Healthy Inside, Thin Outside. We got the idea for this name from a medical term that doctors use called TOFI, which means Thin-Outside-Fat-Inside. It’s a new term used to describe people who appear healthy because they’re thin, but have a lot of internal fat packed around their vital organs, streaked through their under-used muscles, and wrapped around the heart. This type of fat is more dangerous than subcutaneous fat (the kind that lies just under the skin), because it sends out chemical signals within the body which eventually lead to insulin resistance, diabetes and heart conditions. We want people to be HITO, not TOFI. HITO is more than just a food tracker or nutrition analysis program—it’s an educational guide that responds to your specific nutritional needs. It’s like having me—your personal nutritionist—always at your side, giving you feedback on your food choices, and providing you with scientifically proven food suggestions and education to minimize your disease risks and optimize your health. Since June 2014 I’ve spent hundreds of hours creating this program that will revolutionize how people eat. The key feature I’m especially proud of is the food database, which I personally built and customized. I started with the USDA food database, which, by the way, is the same database that EVERY online food tracker and professional nutrition analysis software program uses. It contains basic nutritional information (calories, carbs, fat, protein, cholesterol, vitamins and minerals) for thousands of foods—everything from spices, vegetables, fruits, meats, dairy products, baby foods, fast food and chain restaurant foods, brand name food products, and even Native American and Alaskan Native foods. To make HITO’s database unique and more powerful than any other, I personally reviewed each entry—over 8,000 food items—and added my own identifiers so that HITO will be able to correlate foods to the needs of its users and provide them with education about their food choices. Food Synergies—what foods enhance the absorption of nutrients when eaten together? For example, the curcumin in turmeric is 2,000 times more absorbable when the turmeric is eaten with black pepper and healthy fats. I’ve identified which foods go best together so HITO can make suggestions for the best food combinations. Disease Management or Promotion—we created a select list of common diseases such as diabetes, acid reflux, high cholesterol, arthritis, high blood pressure, inflammation, celiac and others—and then identified each food for its ability to help or worsen these conditions. Acceptability for Certain Diets—I studied the food lists of several dietary plans such as Atkins Paleo, Eat Right for Your Blood Type, South Beach, Gluten-Free and others, and then identified which foods are acceptable on these diets. So, if a user chooses to follow the Atkins diet and is on phase 1, HITO’s database knows which foods to suggest to meet the nutritional requirements of the user without suggesting a food that is not part of the diet. Of course, foods that are acceptable for each phase of The Science of Skinny Processed-Free Eating Plan are identified, making it easy for anyone to eat processed-free! There is a lot more to HITO than its database, but it’s the database that allows HITO to be so powerful and revolutionary. And that’s why I’m so excited for HITO to be born! We have spent nearly three years building HITO, and now we only need $10,000 to finish the programming so we can start improving lives everywhere. I’ve set up an IndieGoGo crowdfunding campaign to help raise the funds. For a pledge of only $10, you can be one of our beta-testers, giving you exclusive access to HITO before it’s released to the general public. We only have 40 days to raise $10,000, so please check out all the details on our Indiegogo page. We’ve got a great launch video and lots of other info that will show you HITO in action. One more thing…..please help share our campaign with your network and spread the word. It really makes a difference! Thank you SO MUCH for all of your support. Here’s the Link to My IndieGoGo project! Thank you in advance for your support!